Have fresh water available for your pet through the winter using the Farm Innovators Heated Pet Bowl. Offering water in a heated bowl helps your pet stay healthy during colder months. This convenient vessel holds one gallon of water, with a wide surface area for plenty of room for your medium to large dog. An internal thermostat controls the heating element, operating only when necessary, for safety and energy efficiency. The generous 55" long cord is covered in a metal spiral, to prevent animals from chewing on it. The plastic body is perfect for use outdoors, and the blue color adds a lovely effect. 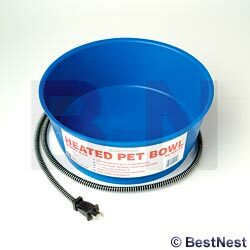 Keep water available for your pet in cold weather with this Heated Pet Bowl. Made in the USA. One year warranty.